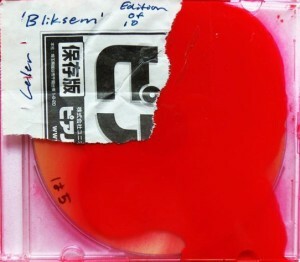 ‘Bliksem’ was created specifically as a special tour CDR for the March tour of the Netherlands and Belgium with Machinefabriek, in a limited edition of 10 copies. The title ‘Bliksem’ is the Dutch word for ‘lightning’. It was chosen because the piece was made by loop and electronics improvisation the night before flying to the Netherlands. The paint wasn’t even completely dry on the CDRs when I arrived. Recorded March 13, around midnight.